Please log in as a Pro member to see the recording of Grisha's August 25, 2015 interview with Eric Brad below. What sort of work do you do in the dog community? What does it mean to be a “cross-over” trainer? Was there an event or experience that caused your change of views to get you to “cross over”? What did you find to be the most difficult part of “crossing over” from your previous training methods? Did you ever find yourself slipping back to the more familiar force-based methods? Many clients have some knowledge of traditional training methods, whether they have seen it on T.V, from internet searches or listening to peoples advice on how to deal with their dogs problems. Do you feel you have more success in changing the way clients think because you can pull on your own experiences? Do you meet any resistance and if so how do you tackle it after seeing both sides? What is your advice for progressive trainers to help people shift to progressive dog training? What surprised you the most about changing to progressive training methods? Did your dogs have to “cross-over” with you as you made the change? What are the special challenges for crossover dogs? How do you overcome them? I recently lost one of my dogs (death) and my middle dog is really having a hard time with it. He has become reactive to other dogs and people he does not know. Any suggestions? How did raising a puppy from the start using science-based training change the experience from when you were using your previous methods? What kinds of things do the traditional trainers do better than positive trainers? If you had one piece of advice to give those trainers who still depend on more traditional, force based training, what would it be? 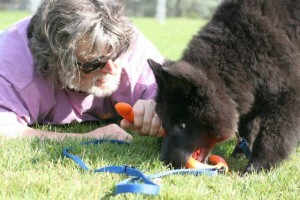 Eric has been been training and living with dogs for over 25 years. In 2002, he made a bold change in his training philosophy by turning away from traditional, punishment-based training techniques to focus on modern animal training methods based on behavioural science and reward-based training. The results have been nothing short of spectacular for Eric and his dogs.Eric is a certified professional dog trainer, having earned his CPDT-KA certification from the Certification Council for Professional Dog Trainers in 2012. He has been fortunate to have learned from some of the best modern animal trainers. Having had instruction from Karen Pryor, Kathy Sdao, Ken Ramirez, Alexandra Kurland, and others, Eric has a clear understanding of the principles of modern behavioural science, the ethology of the modern domestic dog, and importance of good training as part of a healthy lifestyle for dogs. For Eric, using science-based training is a natural extension of his 25 year career in the Information Technology field. Using an approach based on data and proven methodologies helped him be successful in the IT industry. That same approach has enabled him to enjoy great success in working with dogs. Mark and Reward Training, Operant Conditioning, Desensitization and Counter Conditioning, and other techniques are all part of a new way of working with dogs for Eric. 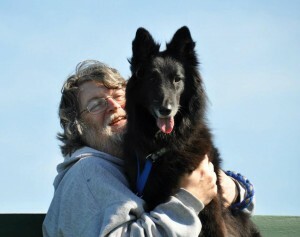 The author of 3 ebooks and more than 200 articles on dogs and training, Eric is a committed writer. His writing is regularly featured at the Life As A Human online magazine. He runs the Canine Nation online site and his work has been published in publications around the world. A key objective in Eric’s writing is to bring a different perspective to dog owners and dog trainers alike to help them explore what is possible for people and their dogs. Now living in Victoria, British Columbia Canada, Eric continues his work with dogs and their owners providing group and private instruction in positive, force-free dog training methods and dog agility. He and his dog, Tiramisu, are active competitors in Dog Agility and have earned multiple Agility Trial Championship titles in both the Agility Association of Canada (AAC) and the North American Dog Agility Council (NADAC). Eric currently shares his life with his wife Petra (also a dog trainer) and his two Belgian Shepherds, Tiramisu and Rizzo. Eric dedicates his writing for Life As A Human to his recently deceased Belgian Shepherds Vince, who taught him so much, and Mario who left us far too soon.